Las Vegas. Another place in the US which I’ve visited multiple times, probably more than any other spot there. Why? It’s complicated. First, it is a convenient base for number of attractions. Just a few hours away are located, amongst others, such gems as the Grand Canyon, Hoover Dam, Zion NP and Death Valley. But, more importantly, Las Vegas is fun. Yes, it is a cliché, but it is true. Of course some pseudo-sophisticated artsy types (especially Europeans) complain about kitsch, a lack of history and culture but who cares? I definitely don’t. In fact I’ve loved Las Vegas ever since my first brief visit there. It was 2001 and it was my first trip to the US. Together with a few friends we were driving across America, all the way from Florida to San Francisco. After spending some time in Grand Canyon we were headed towards Yosemite and Las Vegas happened to be on our way. It is amazing from how far you can see the lights of Vegas. We were crossing the dark Arizona desert, still probably more than 100 miles from the city, when we spotted some brightness on the horizon which grew bigger and shinier with every minute. Initially we weren’t sure what it was but then we realized it was the lights of Vegas. The city itself was hidden behind the mountains and invisible until crossing the Railroad Pass (elev. 721m), just on the outskirts of its suburbs. It was an absolutely amazing view from there. In fact, driving from Arizona via US Hwy 95 is probably the most spectacular approach to Sin City. 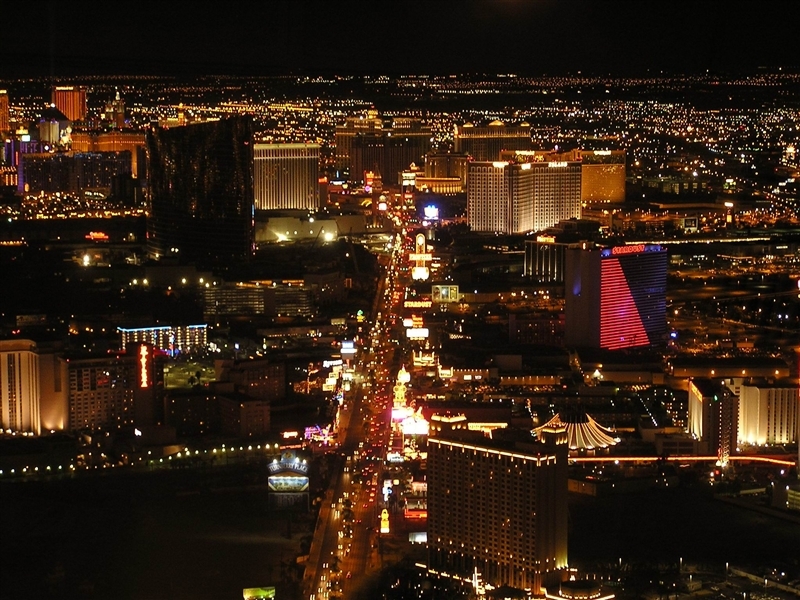 From the pass you will see the sea of lights filling most of the Las Vegas Valley, the brightest spot being of course the famous Las Vegas Boulevard aka “The Strip”. Here let me make one thing straight. To properly appreciate Las Vegas you have to arrive there after sunset. Believe me, I once drove into it during the day and it looked much worse. In fact it looked quite bad, just another typical suburban mess of strip malls, gas stations and fast food restaurants. But come nightfall it is completely transformed into a different planet. Countless neon lights, big bright screens, dancing fountains, music, even fireworks here and there; your senses will be overwhelmed. The best way of getting a good first impression is to leisurely drive along The Strip. Here you will see all the major casinos, bars, shows and masses of tourists. You will also see all the possible flashy cars you can imagine; fast sports cars, muscle cars, stretch limousines, big pick-up trucks and many, many others. It is fun. We arrived there around 11pm and left about 2-3am when we drove off to camp in the desert. It was a short but intense visit. In fact the hours around midnight is the busiest time in this city which never sleeps. We popped into some of the most famous casinos like New York New York, Excalibur, Bellagio or Caesars Palace. These are huge entertainment emporiums full of restaurants, bars, shops and live shows. We obviously lost some money in slot machines and generally had a great time. Still, it was a very short visit and I knew I would be back. And I was. Just a few years later I got there again, this time with two of my mates and ready for some proper fun. 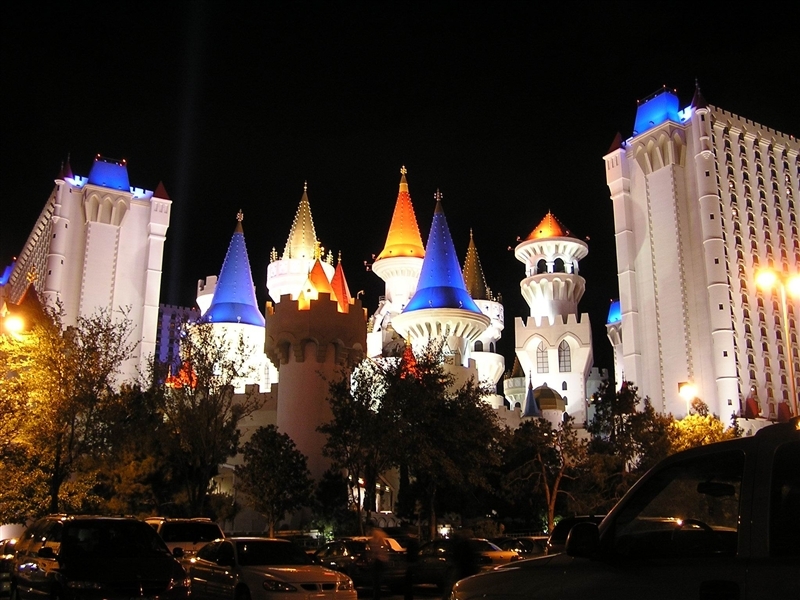 We booked a room in the Excalibur which is located in the middle of the Strip but is still quite reasonably priced. Now, there were three of us but we only got a standard twin room. So by staying there we bent the rules a bit but it was actually a very sensible decision. First, one of us was playing blackjack all night long and second, the room was huge, big enough to house a football team. The shower alone was bigger than the average London bedroom. The Las Vegas hotels are much more than simply places to stay. They are tourist destinations in their own right. Take for example our 4000-room Excalibur. It is a medieval fantasy with kitschy turrets, walls and a draw bridge as well as statues of knights guarding the entrance. It feels like something of a cross between the Disney Cinderella castle, a corporate hotel and a bordello. And it is not the only fantasy in Vegas. There is for example New York New York which imitates the skyline of the Big Apple and has a roller-coaster running through it and around the surrounding streets. There is Paris Las Vegas with its half-size replica of the Eiffel Tower and a two-thirds size Arc de Triomphe. In the Venetian you can ride in an “authentic” Venetian gondola right down the Great Canal while outside the Bellagio you can watch a dancing water fountain. But my favourites are the Luxor and the Stratosphere. You won’t be able to miss the Luxor as its shape is immediately recognizable. It is an 111m high, 30-story dark glass pyramid located on the southern end of the Strip. The tip of the pyramid contains a spotlight that points directly upwards and is claimed to be the brightest beam in the world. On a clear night, the Sky Beam is visible up to 250 miles away and it is also apparently clearly visible from space. Around the main building there is the usual Las Vegas kitsch, in this case the Egypt-themed 43m-high obelisk and a recreation of the Great Sphinx of Giza; the Luxor is a prime example of 1990s Postmodernist architecture. Stratosphere Las Vegas might be not so striking architecturally but it is home to one of the best attractions in Vegas, the Stratosphere Tower itself. At 350 metres it is the tallest free-standing observation tower in the US and the second-tallest in the western hemisphere, surpassed only by the CN Tower in Toronto. Being the tallest structure in the city it offers unparalleled views of the whole Las Vegas valley. We went there in the evening and the view of the sea of lights was absolutely amazing. The top of the tower is also home to some of the craziest thrill rides you can imagine. For example the, aptly named, Insanity which dangles riders over the edge of the tower and then spins in a circular pattern. It was way too insane for me. Unfortunately my favourite attraction, The High Roller, was dismantled in 2005. It was the highest roller-coaster in the world and even if it was slow and gentle, by comparison to standard ones, it was still quite thrilling as it seemed that there was nothing between the track and the Las Vegas Strip below. The Strip is like no other place anywhere. Home to some of the biggest hotels in the world, the brightest lights and some of the weirdest shows, it is definitely one of the America’s must sees. Where else could you see dancing fountains (outside Bellagio), mock volcano eruptions (outside The Mirage) and Sirens battling pirates (outside Treasure Island) on one street? As I mentioned before during the day Las Vegas loses most of its appeal so it is good idea to escape it and visit some of the surrounding attractions. One of them, the Hoover Dam, is located less than an hour’s drive from the Strip and it is a true marvel of engineering. Built during the Great Depression it is also still one of the largest man-made structures ever constructed. Its sheer size together with its stunning location should put it on everyone’s itinerary. In general, Las Vegas is one of my favourite attractions in the US. I deliberately didn’t call it one of my favourite cities because it is hard to treat it as a city as such. Sure, people live there but you don’t go there to visit a city. It is more like a theme park for adults and as a such it is brilliant. In my opinion all those people who complain about Vegas, about its kitsch, noise, lack of culture or urban sophistication totally miss the point. It is oasis of fun stuck right in the middle of desert. If you treat it like that you will have fun yourself. This entry was posted in Uncategorized and tagged Ceasars Palace, Excalibur, Hoover Dam, Las Vegas, Las Vegas Boulevard, Sin City, Stratosphere Tower, The Luxor, The Strip on January 8, 2013 by admin.